Description: This short course is open to HR professionals and team leaders. With a focus on the MoE dramatic conventions, the participants will be able to take part in a MoE session led by Roberta Luchini and will have time to start thinking about new strategies to develop their teams using the conventions during the training sessions. Roberta Luchini has been studying and practicing MoE since she undertook her Master's in London on Applied Drama in 2011. Her final Master's thesis was on the potencialities of MoE for the Brazilian educational system. She also took part in workshops with Dorothy Heathcote, residentials with Luke Abbott and Tim Taylor, and more recently spent two weeks in an immersion at the Mantle of the Expert Training School: Woodrow First School in Redditch. 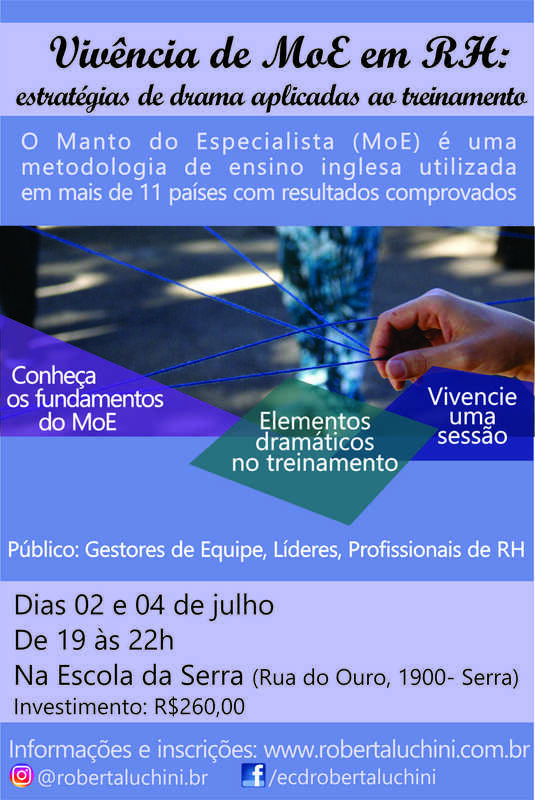 Roberta is actively expanding awareness about MoE internationally, in particular in Brazil, through running courses and providing materials and information online in Portuguese.